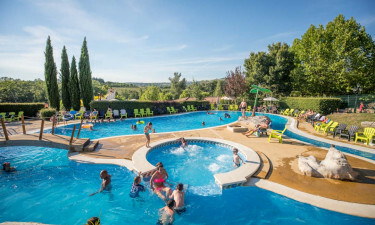 One of the best camping destinations in Ardèche, this beautiful campsite offers a family-friendly destination for your next holiday. Camping Le Pommiers offers a striking natural setting in the Auvergne-Rhône-Alpes region of south-central France. A highlight is the campground’s exciting waterpark and its thrilling waterslides. Situated in Villeneuve-de-Berg, Camping Le Pommier is surrounded by pristine forests. You can enjoy a peaceful hike or bike ride. You can also visit one of the region’s beautiful villages, including nearby Balazuc, Rochecolombe and Vogué. Whether you are visiting with your mobile home or staying in your tent, book your stay at this friendly holiday camping spot today with LuxCamp! Why Choose Camping Le Pommier? 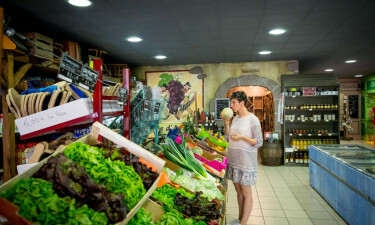 From shops with grocery essentials and a snack bar to Wi-Fi access and a nightclub, this luxury camping destination has everything you need for a memorable stay. Fun activities keep you entertained throughout your stay. 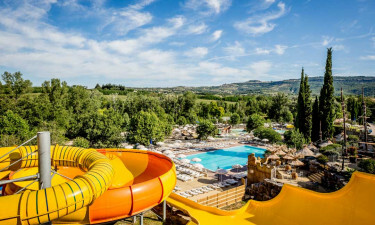 Camping Le Pommier also has one of the best waterparks you will find at a holiday camping site. Camping Le Pommier’s spectacular waterpark entertains visitors of all ages. You can cool down and swim in three pools, or zoom down one of the park’s seven exhilarating slides. Comfortable sunbeds line the edge of the pool, offering a relaxing spot for you to soak in the sun during your camping holiday. Camping Le Pommier has great amenities. At the heart of the luxury camping site is a restaurant and bar, as well as a snack bar and nightclub. Sports pitches are perfect for enjoying football, basketball, tennis, and other sports. There are also dances, sports tournaments, sport competitions, and other activities organised at this welcoming campsite.